Kristine's education and experience in illustration ad composition brings an original style, sensitivity and craftsmanship to her batik work. 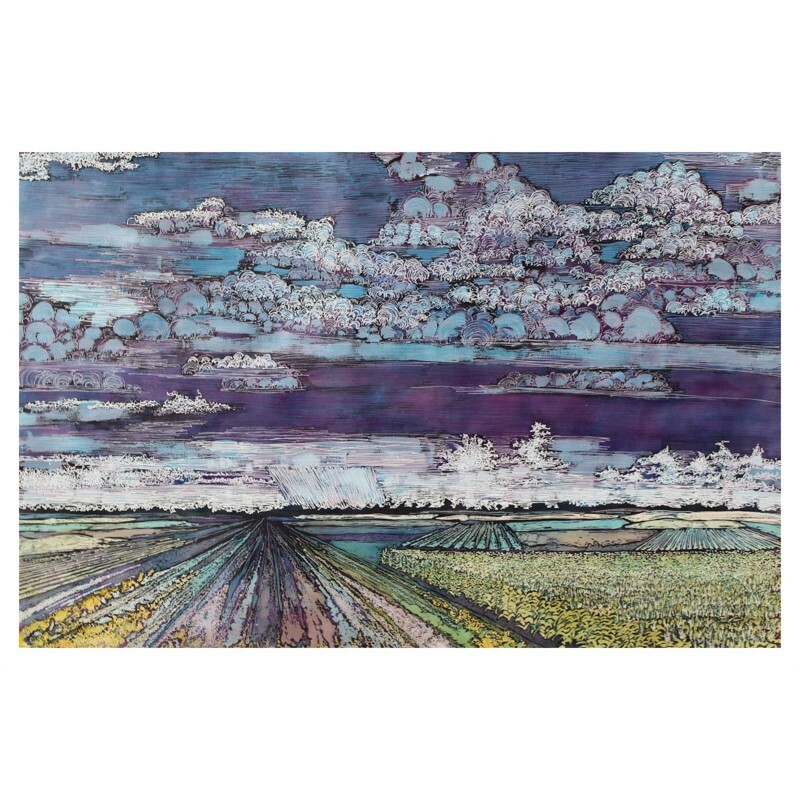 She has won numerous Best of Show awards and solo exhibitions including Stuhr Museum and Norfolk Arts Council. She was featured in the April 2016 issue of Art and Architecture Magazine as an emerging artist to watch, Nebraska Magazine as well as other numerous publications and articles. Her work has been purchased for use on Hollywood movie sets, corporations, hospitals and private collectors as far away as Canada and Sri Lanka. Although Batik is a challenging medium, Kristine's goal and purpose as an artist is to push its limits to a level of fine art. 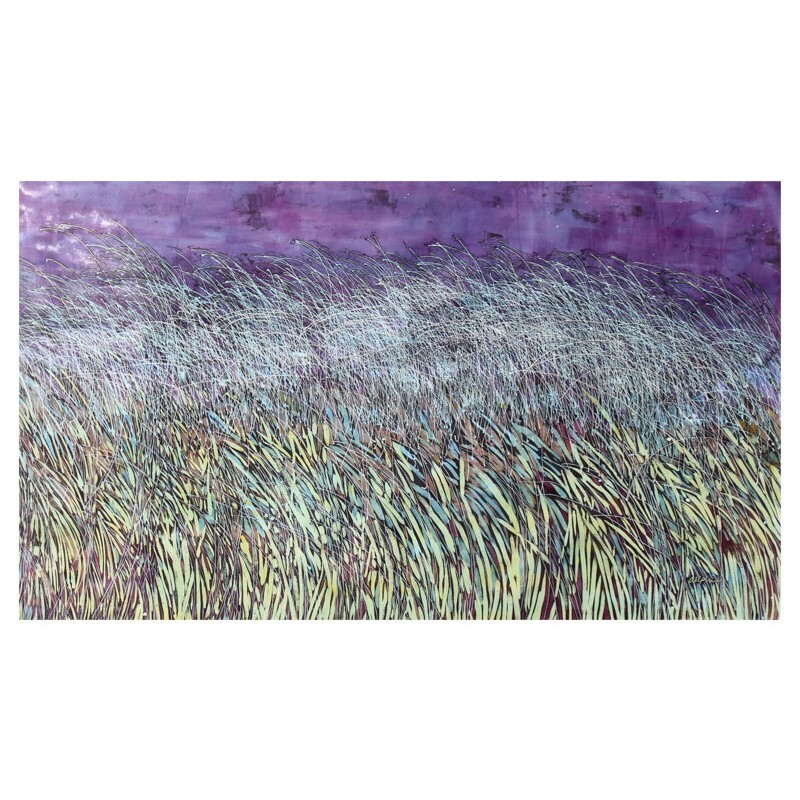 She utilizes her knowledge of illustration and design and experimentation of nontraditional batik materials to produce the many complicated color blends and combinations. She and her family reside in Hastings, Nebraska where she finds inspiration in the always-changing seasons, native grasses and vast prairie landscapes. Unlike the traditional art forms, my pigments and dyes are of primary colors. Secondary and tertiary colors are created as the primary layers mix on the paper. As an artist, I choose the shades of yellow or blue, but the batik chooses the resulting green. This process may appear limiting, but within those limitations are limitless possibilities. Often like life itself, the very process requires a give and take and a relinquishing to the results without an attachment to the outcome. Batik is an ancient decorative art used to embellish textiles. The textiles or paper is immersed in a dye bath. Wax is applied to preserve the color. This process is repeated many times creating additional color combinations and detail. In the end, the wax is removed revealing the finished art. Today, many batiks are created by painting the dye on the fabric. This is considered a faux batik method. Kristine prefers to use the ancient vat dying method when applying the dyes to the textiles. This traditional process is time consuming and complicated, but each color is a combination of the previous applied colors, causing her to work from primaries to neutral and light to dark hues. A thorough understanding of color theory is required for this process, but the results are the unique color combinations found in her work. Biography Kristine's education and experience in illustration ad composition brings an original style, sensitivity and craftsmanship to her batik work. 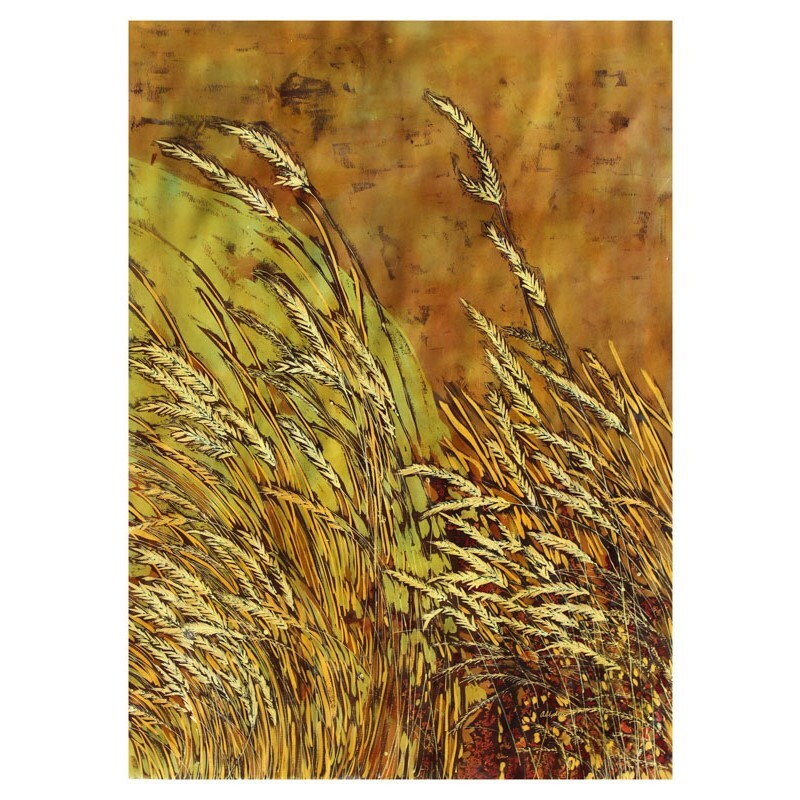 She has won numerous Best of Show awards and solo exhibitions including Stuhr Museum and Norfolk Arts Council. She was featured in the April 2016 issue of Art and Architecture Magazine as an emerging artist to watch, Nebraska Magazine as well as other numerous publications and articles. 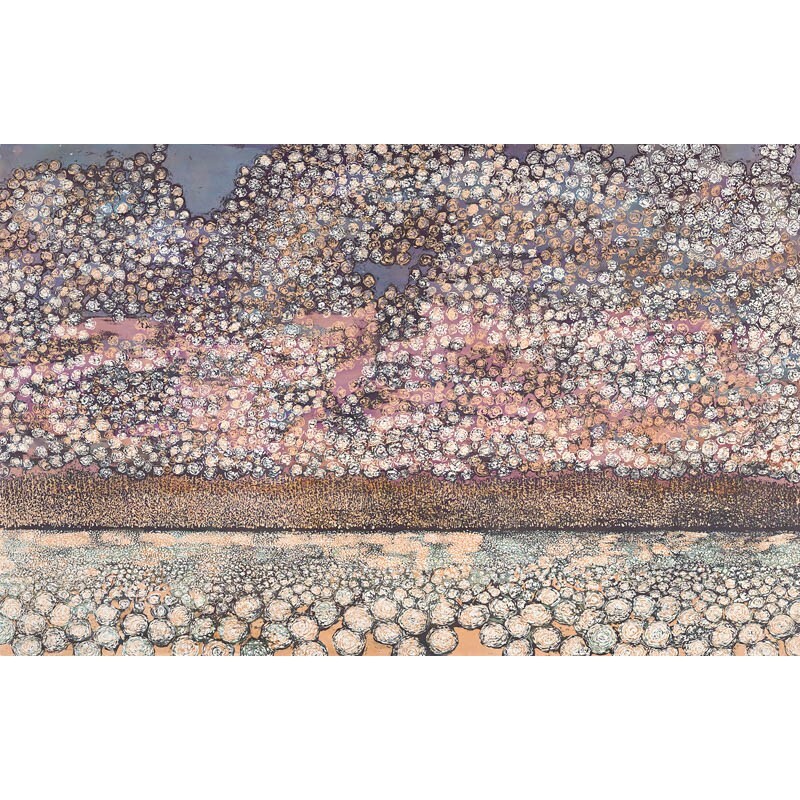 Her work has been purchased for use on Hollywood movie sets, corporations, hospitals and private collectors as far away as Canada and Sri Lanka. Although Batik is a challenging medium, Kristine's goal and purpose as an artist is to push its limits to a level of fine art. 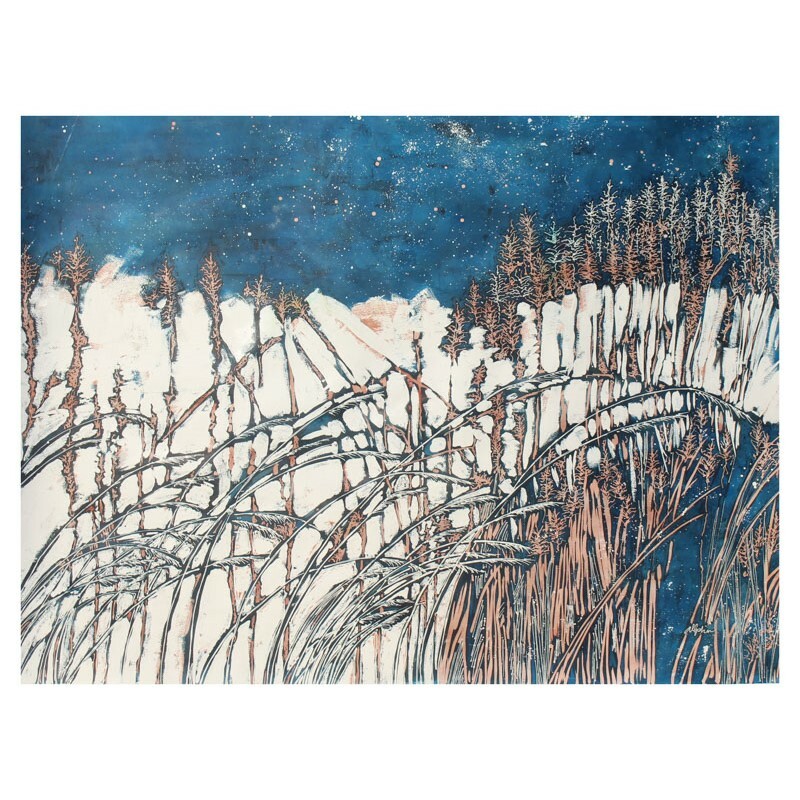 She utilizes her knowledge of illustration and design and experimentation of nontraditional batik materials to produce the many complicated color blends and combinations. She and her family reside in Hastings, Nebraska where she finds inspiration in the always-changing seasons, native grasses and vast prairie landscapes. Artist Statement Unlike the traditional art forms, my pigments and dyes are of primary colors. Secondary and tertiary colors are created as the primary layers mix on the paper. As an artist, I choose the shades of yellow or blue, but the batik chooses the resulting green. This process may appear limiting, but within those limitations are limitless possibilities. Often like life itself, the very process requires a give and take and a relinquishing to the results without an attachment to the outcome. What is Batik? Batik is an ancient decorative art used to embellish textiles. The textiles or paper is immersed in a dye bath. Wax is applied to preserve the color. This process is repeated many times creating additional color combinations and detail. In the end, the wax is removed revealing the finished art. Today, many batiks are created by painting the dye on the fabric. This is considered a faux batik method. Kristine prefers to use the ancient vat dying method when applying the dyes to the textiles. This traditional process is time consuming and complicated, but each color is a combination of the previous applied colors, causing her to work from primaries to neutral and light to dark hues. A thorough understanding of color theory is required for this process, but the results are the unique color combinations found in her work.